In July 2009, just two days after Goldman Sachs told the FBI that Sergey Aleynikov, a computer programmer at the firm, had removed source code containing trade secrets, Aleynikov was arrested by the FBI. Aleynikov was then prosecuted by the U.S. Justice Department and spent 51 weeks in prison before the Second Circuit Appeals Court threw out the case against him. The Appellate judges found the case against Aleynikov so unfounded that it ordered him released from jail immediately at oral arguments. The Second Circuit opinion in the Aleynikov case was handed down on April 11, 2012, finding that the prosecutors misapplied the Federal corporate espionage laws. But Goldman Sachs and the FBI weren’t happy so they handed their evidence to Cyrus Vance, the Manhattan District Attorney. Under the Fifth Amendment to the U.S. Constitution, an individual is not permitted to be tried twice for the same crime. But notwithstanding that, Vance brought a case against Aleynikov in State Court. That case was also thrown out on appeal. If you are at all familiar with Goldman Sachs, you know that what Marino is saying may well be an understatement. And, that’s only what we know so far. The FBI is currently reviewing thousands of emails that went over Hillary Clinton’s private server that were left on a laptop owned by Anthony Weiner, estranged husband to Abedin, who has been disgraced in a series of sexting scandals and is now under a Federal probe for allegedly sexting with a 15-year old girl, whom he allegedly knew was underage. Two scathing government reports capture how the above hubris played out in the handling of government secrets by Hillary Clinton and her crew. The first report was issued by the State Department’s Inspector General in May of this year. It found that Clinton had told multiple untruths in the matter, including the falsehood that she had received permission to set up the private server in her home. The second report from the FBI followed a criminal investigation and was delivered verbally on July 5 of this year by FBI Director James Comey. The FBI report left no doubt that Clinton’s repeated assertions to the public over many months that she had not transmitted any classified material over her private server were, in fact, not true. 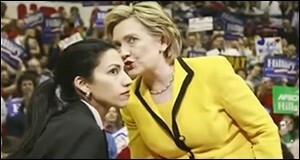 On June 28 of this year, the government watchdog organization, Judicial Watch, conducted an extensive deposition of Abedin as part of their Freedom of Information Act lawsuit against the U.S. Department of State. Abedin appeared at the deposition with an eyebrow-raising legal team from not one, but two, high-priced corporate law firms: Michael Brille and Martha Goodman of Boies, Schiller & Flexner LLP; and Miguel Rodriguez from Bryan Cave LLP. When the attorney conducting the deposition on behalf of Judicial Watch, Ramona Cotca, asked Abedin: “Who is paying for your legal fees for your representation in this lawsuit?” Michael Brille of Boies, Schiller instructed Abedin not to answer the question. Despite acknowledging that there had been careful review with her attorneys of the exhibits she would be asked about during her deposition, Abedin gave many problematic answers. She indicated that she was aware that any documents being removed from the State Department when Clinton and her team left had to be carefully screened by veteran staff with the boxes then sealed and signed off on for removal. But despite that awareness, Abedin acknowledged that she had relayed emails to her private email accounts for printing and then left the emails on the non-secure external devices. Abedin has worked for Hillary Clinton for two decades, starting out at age 19 as an intern in the White House when Clinton was First Lady. Abedin held the title of Deputy Chief of Staff for Operations when Clinton was Secretary of State and currently serves as Vice Chair of Hillary Clinton’s presidential campaign. When Abedin married Weiner in 2010, Bill Clinton officiated at the ceremony.